As you already know, we are leading a balanced diet, eating in moderation, and if I can help it, infusing our breakfast and baked goods with healthy elements. If you are a frequent visitor here, you know of my love of anything oats. Chia seeds, I am mostly unfamiliar with, though a few months back, I baked chia seed muffins which I liked, but never ended up posting. So when Health Warrior approached me about this collaboration, I was curious to explore this relatively new to me ingredient's traits in baking and cooking and its health benefits. As the founders of Health Warrior's put it on their website "...we learned about the benefits of chia while reading the best-selling book 'Born to Run', about the Tarahumara Indians and their jaw-dropping long-distance runs. 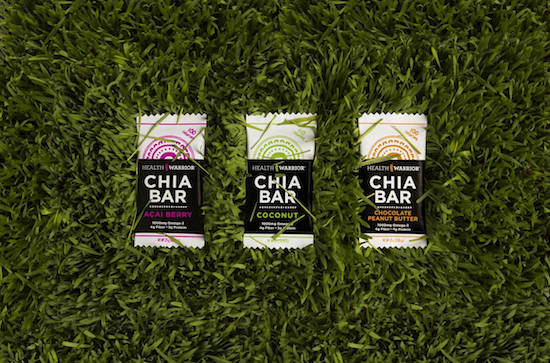 The Tarahumara, like the Aztecs before them, are Powered by Chia." The founders of Health Warrior incorporated this nutrient-dense superfood into their diets and next thing Health Warrior was born. Chia seeds are rich in Omega 3, protein, calcium, antioxidants, fiber and magnesium among other nutrients. ** Look at this beautiful illustration comparing chia seeds to salmon, milk, oatmeal and broccoli, you will be as amazed, as I was, looking at the nutritional data. 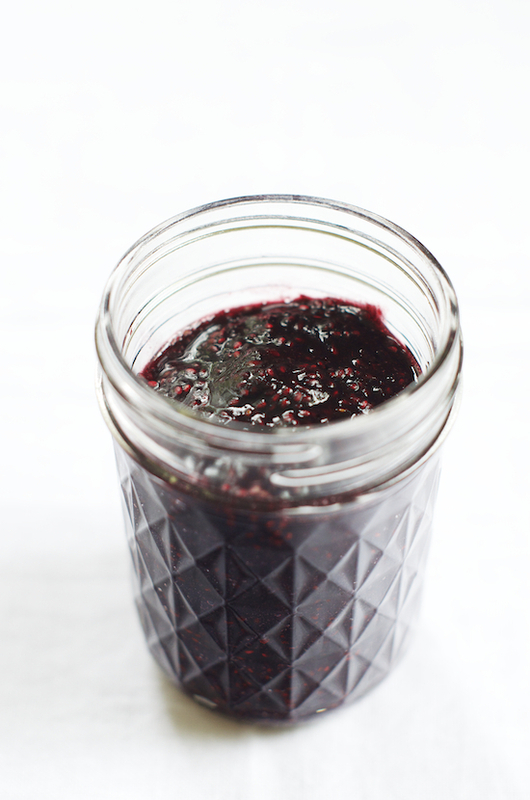 I decided on this Blackberry Chia Seed Jam recipe as I thought the chia seeds would be a playful fun against the blackberry seeds. I was also curious about the chia seeds 'glue-like' properties and knew it would have a positive effect on gelling the jam. Acting sort of like pectin. It would in fact be great in any low pectin fruit jam while adding nutrients. Make sure to check out Health Warrior's website for additional recipes, tips, their blog and the accolades and mentions they received. 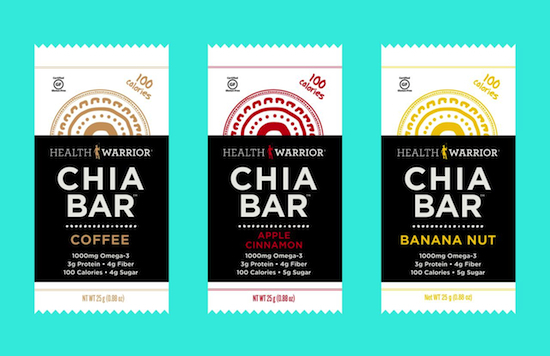 Plug in your zip code here to find Health Warrior chia bars and seeds near you. I was pleasantly surprised to find 7 stores in my zip code area that carry Health Warrior. Whole Food Stores and Wegmans. You can also shop online, but before you do, enter for a chance of winning 18 chia seeds bars and 1 chia seeds bag. 2 lucky winners will be announced in a week. *Chia bars are 100 calories each (only the coconut bar is 110 calories) and with just 5 or less grams of sugar. They are 100% natural, vegan, dairy-free and soy-free. Chia bars contain and may contain tree nuts. Chia seeds do not contain tree nuts. Chia seeds are certified vegan, certified kosher and certified gluten free. Chia bars are vegan and gluten free. 3. Post on Twitter or Facebook "I have entered @Foodwanderings @Health_Warrior 's Chia Seeds and Chia Bars Giveaway. Enter to win. A bonus recipe www.foodwanderings.com"
5. Giveaway to 2 readers with a US mailing address. Sorry my friends elsewhere in the world. 6. Leave up to 4 comments letting us know you followed and tweeted. Let us know if you are already incorporating chia seeds into your diet, and if not, what do you think is the best way to introduce them into your diet? 7. The lucky winners will be picked by random.org at midnight Thursday, August 1. The giveaway will be open until then. Bring the water to a boil in a small pot and add the sugar. Turn down the heat to low/medium, add the sugar. Once the sugar is dissolved remove from the heat. This is your simple syrup. Combine two tablespoons of the simple syrup with the blackberries in a blender and whiz until they reach a smooth even consistency. Transfer to a jar and blend in 2 tablespoons of chia seeds. If the jam seems too thick, add 1 additional tablespoon of simple syrup or water. If the jam seems too thin, add an additional tablespoon of chia seeds. Refrigerate for at least 1 hour and enjoy. Save the remaining simple syrup for a drink, fruit salad or a sorbet. Disclaimer: This post is a sponsored post and is a part of my professional collaboration with Health Warrior. Samples of both Health Warrior's white and black chia seeds were provided to me for the purposes of making this recipe. **For a complete health profile of chia seeds you should consult a doctor or a nutritionist. An interesting jam! I bet it tastes divine. I've never had chia seeds... They are not cheap here unfortunately. I love blackberries, what a delicious looking jam! I adore sweet summer blackberries...and this is a delicious way to enjoy them all year long! I followed Health Warrior on Facebook! Love using chia seeds in my smoothies and granola bars! Followed Health Warrior on Facebook! Love using chia seeds in smoothies and granola! Follwed Food Wanderings on Facebook! 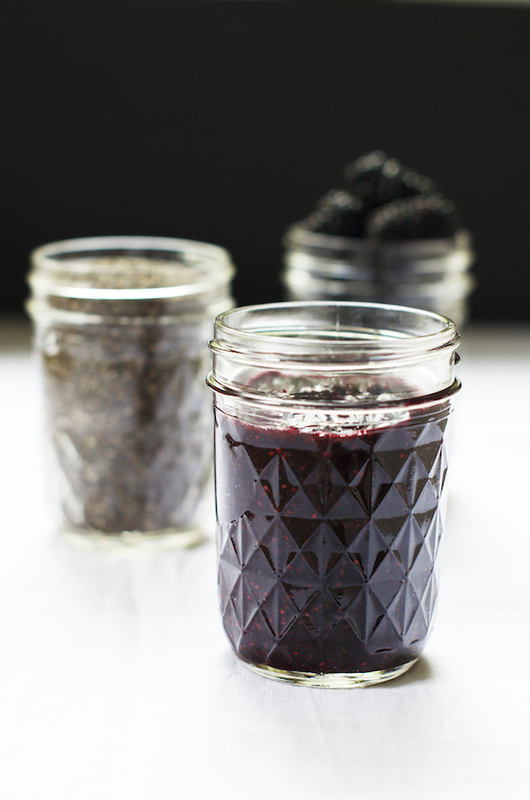 Can't wait to try this chia seed jam recipe! I follow you on Twitter and FB of course! I use chia seeds mostly in my morning smoothies and juices! Very unique and interesting jam. What a perfect way to enjoy berries. 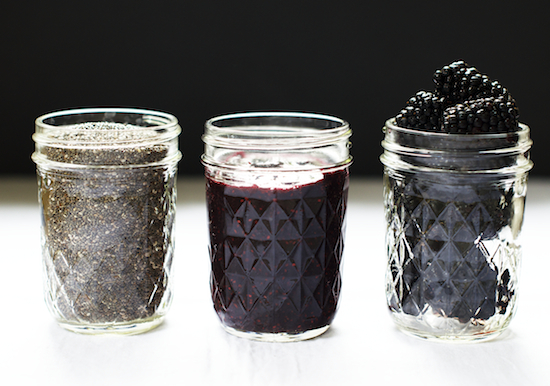 I love the idea of using chia seeds as a way to thicken jam and other foods. So interesting - glad you experimented with it in such a clever way. I have not yet tried chia seeds yet but my husband and I are both very health conscious and care a lot about healthy eating and have read the benefits of chia seeds and would really love to try these products, plus they sound delicious too. I need to start using chia seedsagain. i've thown them in smoothies, granola bars, oatmeal, made chia jam, and used them as an egg replacement. i've also tried a chia pudding but I wasn't fond of it. I've liked everythimg else though. no options for us who don't do social media? :( I would love to try them!!! @anonymous of course if you are not on social media you are still welcome to enter. Thx for your email address. Liked, shared, tweeted. I have been trying to incorporate chia seeds into my diet by making a "smoothie" and adding some in. A healthy, low carb snack with them would be wonderful. I found out about Chia Seeds a few years ago and I have been experimenting with a few ideas in Healthy Organic/Natural Products I make to see how I can incorporate them. For what I'm creating, this is just the start of it, lots more Ideas in the pipeline!! Now a Health Warrior Facebook Fan! I like Food Wanderings on Facebook! I follow Health Warrior on FB. My favorite way to use chia seeds is to make the chia seed pudding with almond milk and chia seeds. Divine if using the chocolate almond milk!